Views On Top showcases the best scenic destinations around the world. Likened to the 'child of Instagram and TripAdvisor', the app helps people easily find places with great views in 85 countries, with stunning images, a summary of what to expect, opening times, maps, directions and more. 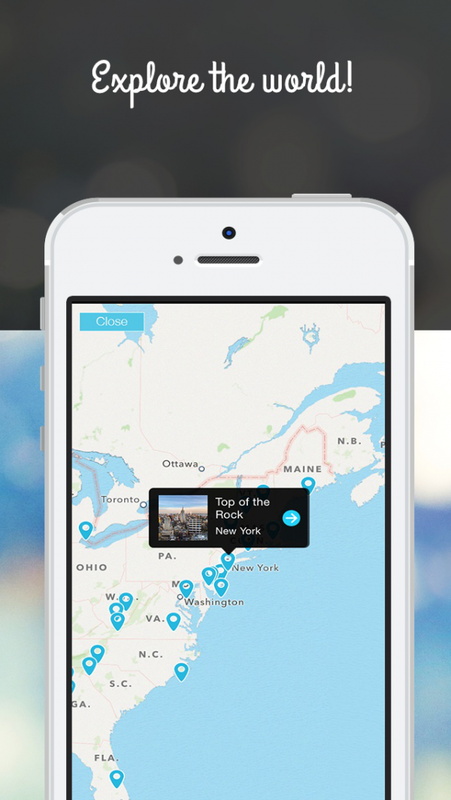 On personalised world maps, users can build a bucket-list of places they want to visit and record where they’ve been. Views On Top encourages sharing of photos, comments, and recommendations for locations with views, plus you can book tickets and reserve hotel rooms direct from the app. Views On Top's founder is Margaret Scott, a keen traveler and self-titled 'Chief ViewOlogist'. The app was co-designed with the team who managed the technology build, Buzinga App Development, in Melbourne. The project brief was to provide a beautiful, simple-to-use tool to find and share information on places worth visiting for their fabulous scenic views, all around the world. Often frustrated by not knowing where to go for a good view upon arriving in a new destination, the founder personally researched over 700 places in more than 400 popular destinations across 85 countries, categorised them into 19 experience types, and with the creative team, designed a user experience to intuitively display essential information along with inspirational images in a fun, interactive application. Designed for leisure and business travelers alike, a user can arrive in a new location and just look at the 'Near Me' screen to see where to go for a view. Or if you prefer to plan in advance, be inspired to experience a multitude of destinations by searching in several ways. Many travelers seek out places with panoramic views when they arrive in a new place. Until now, finding where to go for a good view often required trawling through guide books or searching online. The 'Near Me' functionality in Views On Top makes it very easy to find scenic destinations to visit when you arrive somewhere new, with essential information saving users from needing to do their own research. Destinations in the app range from famous to unknown and free to five-star, and include many hotels worth staying in for the view from their rooftop bar, pool or gastronomic experience, also highlighting when special areas are only accessible to hotel guests. Tourists can book tickets to popular attractions in advance and be sure they'll get in and avoid having to queue on arrival. Pre-booking is becoming increasingly important as some destinations, like Dubai's Burj Khalifa, can sell out tickets for days at a time. Views On Top's information has been curated from personal experiences, recommendations and extensive online research, to ensure all major tourist destinations and popular attractions with views around the world are included. 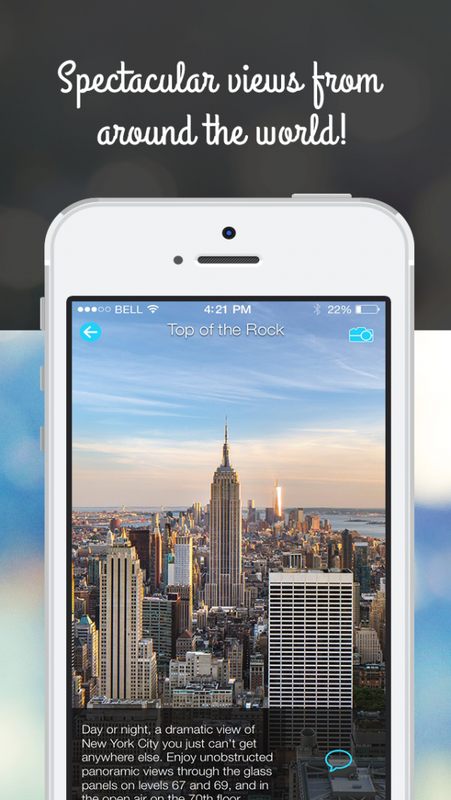 The app's content will grow with users' recommendations. With a goal to only have 'quality' destinations, users can be sure that if a destination is in Views On Top, it's worth visiting for the view. 4. A user can submit comments, images and suggest locations to add. User-generated content, once approved by an administrator, will display the user's name. 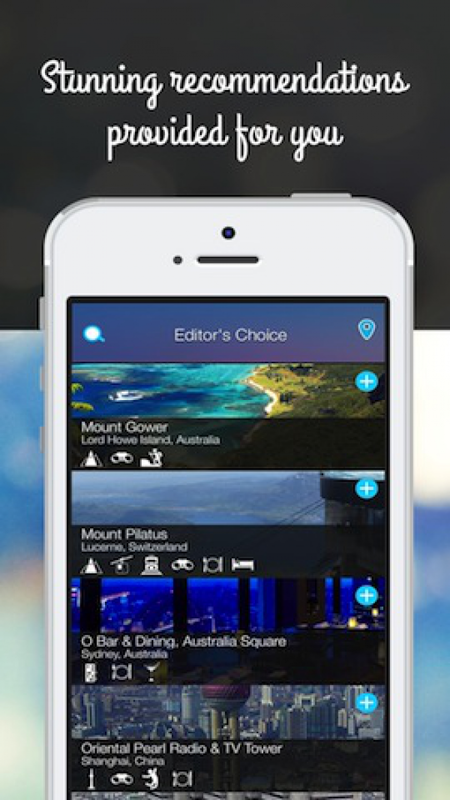 No other travel app focuses on views and scenic destinations. 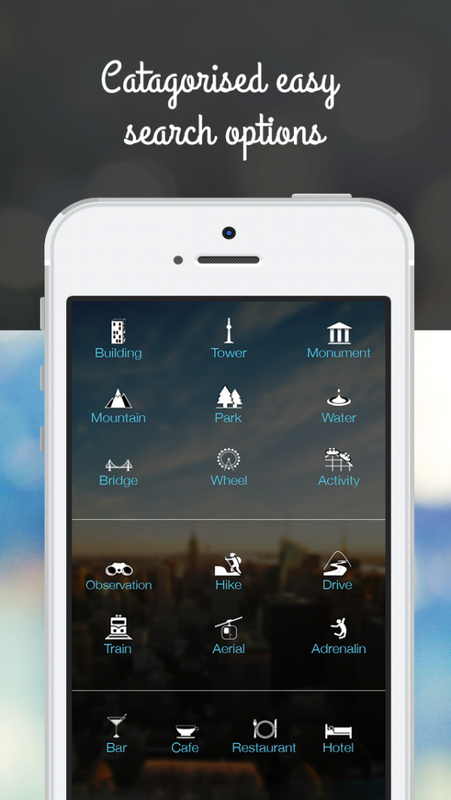 We chose an app title and key words to maximise App Store Optimisation for people looking for scenic destinations, and aspire to being featured on the AppStore. We are engaging with our users ('Viewsers') through social media, with daily posts to Instagram, Twitter and Facebook. On the Views On Top website, we post blogs of personal travel experiences, encourage guest-blogger posts and send occasional newsletters to our subscribers. 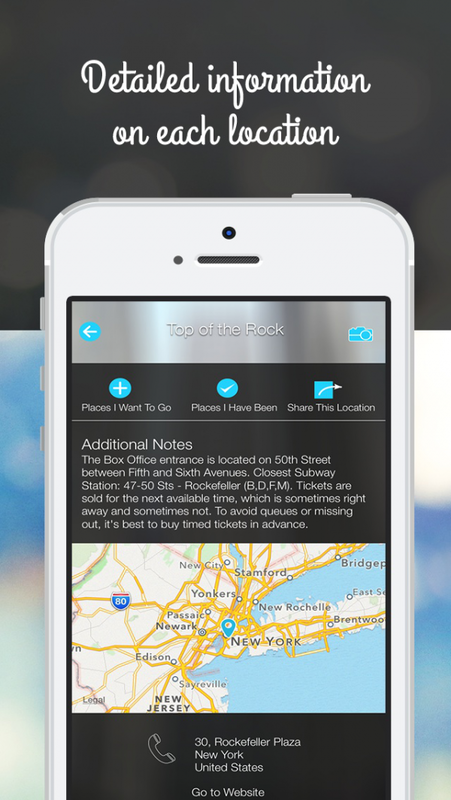 We've made it easy for users to share their experiences of places they visit with their friends. Tapping buttons in the app generates posts to the user's Facebook and Twitter accounts, with embedded links making it easy for friends to download the app. Press releases to travel magazines and online publications upon the initial launch in May 2014 generated wide media coverage in Australia, the US and even Ireland; more press releases will follow with the launch of updated versions. We also regard destinations in the app as our customers, and have liaised with several Sydney-based overseas tourist office representatives to ensure we've got their countries well covered. A global online service, eHotelier, introduced Views On Top to the hotel industry, prompting several destinations to ask to be included in the app. Only basic contact details are collected when people login to use Views On Top, users may opt to provide additional personal information. A user's username is displayed in the app when they submit a photo or comment, there is currently no functionality within the app for users to make contact with each other. GPS technology (or similar) is used to determine a user's location in order to display maps and details of local destinations. We don't share a user's destination with others. We have physical, electronic and procedural safeguards to protect information we process and maintain. Anonymised, aggregate data is used to generate data shown on the the 'Popular' locations screen. Users can easily opt-out of receiving communications.